You're a real ray of pragmatism as always, Adrian. I'm disappointed in you though. We're almost into pre-season testing, and no rant about Lando Norris and his daddy's money? I haven’t warmed up for this year yet (-: I hope Russell gets a car that can show his obvious talent, it will be interesting to see how competitive the Ferrari Romeo is, Horner is already busy rehearsing his excuses, other than that I’ll go back to sleep for a bit. Last edited by adrianw; 11th February 2019 at 21:30. I think Lance Stroll has set the bar too high - his daddy bought him an entire team! F1 title sponsorship is a funny world these days. One team is now sponsored by an energy drink that isn’t really sold anywhere, it seems. And now, another team is sponsored by a ‘phone company that hasn’t sold any ‘phones. What could possibly go wrong? Finding a team that has been sponsored by Seaborne Freight? The Williams colour scheme looks good this year! I’m pretty sure it won’t be, but the new McLaren looks great! Good lord. Somebody took a step back, looked at that and thought "Mmmm, that looks good!" What a complete dog's dinner. 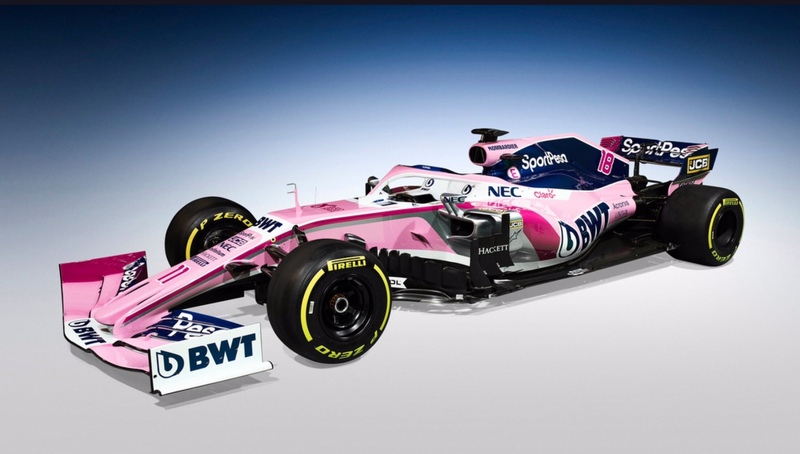 There's a common theme among all of the colour schemes revealed so far, in that the areas of interest, namely the lower nose, barge boards, front and undersides of the sidepods are all black, which means that interested parties can't look at any of the intricate aero solutions. 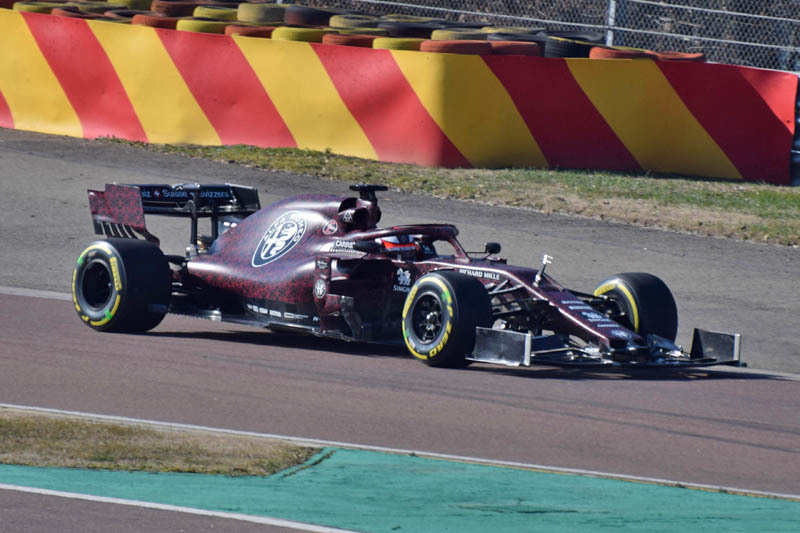 If anybody can find a head-on shot of the Alfa front wing, please post it. Thanks. The colour scheme is either temporary or permanent, depending on who you listen to. At this stage of the pre-season there's a lot of misinformation being bandied about as fact. I'm not convinced - but then again I've never liked the McLaren orange and I like the dipped-wings blue even less! I certainly hope they make progress this season but I'm not holding out much hope. Yep, the Force car looks as bad as last year. this is sort of interesting, I haven't a clue if it is accurate. I'm rubbish at posting pictures but starting to think the Ferrari and Alfa front wings are dummies. Last edited by adrianw; 15th February 2019 at 11:58. Thanks for that, Adrian. It seems that the teams have gone in different directions with front wing design, either the radical Alfa solution which minimises the number and width of the maximum five permitted elements, or the more conservative route of using five elements which extend to the endplates. Most teams are using one of their permitted "filming days" as a pre-pre-season test. They are restricted to 100km, and must run specific non-race compound tyres supplied by Pirelli for these sessions. A quick word on tyres for this season - Pirelli will as usual supply three different compounds for each race weekend, but instead of having the various compounds identified by their colours on the tyre sidewalls, they will now only use three colours: White for the hardest compound, yellow for Medium, red for soft. Which means that for Silverstone, the hardest compound, previously blue, will be white, and the softest will be the 2018 Medium, previously coloured yellow, which in 2019 will be red, whereas for Monaco in 2019 the red tyres, which were previously Soft, will be white, and the Hypersofts, which used to be pink will now be red. Interesting new role for Rob Smedley. none of us can really gleam anything from the test as we haven't a clue what the teams are actually doing but Williams not tuning up is very bad news. On first sight, it came across to me as being mainly a PR/Marketing role. It'll be interesting to see how it works out. It is, at least that's how I read it as well. It'll be his role to give greater insight as to how the teams and cars function on a technical basis, as long as the correct balance is achieved between getting newbies hooked and more experienced fans informed then this can only be good news. Sky F1 are currently showing the first day's test sessions, they'll also be broadcasting over the week 1pm-6pm. Karun Chandhok has moved from C4 to Sky this year and is commentating alongside David Croft, Ferrari on track with Vettel at the wheel. Seems they will miss tomorrow too. What a shame. They are in my perception one of the most sympathetic teams. I wonder how F1 will develop with Ferrari now in effect fielding síx cars. That gives them a silly amount of clout and we all know how they wield that clout. George Russell was putting a brave face on with regards to his team's situation, he basically said that it won't matter that much that they'll lose two days testing. Yeah, right. Ferrari will certainly have some "clout" over the grid what with Haas and Alfa both being considered to be teams with technical links with the Italian outfit. I think I'm also correct in stating that the Torro Rosso doesn't only share the engine with Red Bull but also the entire back end - engine, gearbox and, therefore (I'd imagine, due to the mounting points), suspension as well. Last edited by CardShark; 18th February 2019 at 14:54. Is this McLaren's best pre-season testing day in years? 1) Car drives 2) 56 laps so far 3) Not slowest. I think it might be time to introduce some rules about team and associated team tactics, blocking,slowing, pitlane etc., Ferrari were spoiling races last season using these tactics. Get caught obviously doing it and a time or grid penalty. For sure none of the teams showed their teeth and they all had their own test/tactical obejectives. Mercedes being a case in point. Reliability though was a good show. Though not likely anything near full bore, the Hondas were at the sharp end of this game ánd lasted a lot of laps. My worry concerning Ferrari is their clout behind closed doors. Even with Mercedes being thé team to beat and then some, Ferrari are close to béing F1. We can just hope that there is a Red Bull in the china shop. For the first day of pre-season testing, that was remarkable for an almost complete lack of mechanical "issues". Drawing too many conclusions from pre-season testing is impossible, due to variations in fuel loads, ballast, tyres, and other variables, but today was notable for the lack of red flags (there are few marshals, and any stranded cars need to be recovered to the pits before running can resume, so a breakdown will result in the session being red flagged), and the number of laps completed. McLaren fans will no doubt delight in the second fastest time set by Carlos Sainz, but Williams are struggling to even get their car on track, at a time when they need as much running time as possible. Even if they make it out on Wednesday they will have lost 25% of testing time, and every lap counts as it generates data which is needed to fine tune the car, and compare "actual" aero results to those from the wind tunnel and CFD. Tomorrow will feature some of the new generation of drivers, with Lando Norris, Alexander Albon and Charles Leclerc due to perform. It would also have been George Russell's first opportunity to drive the Williams, but he will once again be in the paddock while the others get to grips with the new 2019 cars and their revised aero. The red bull looks phenomenal. Tiny tiny side pods an a very aggressive rear. I really hope they’re back in proper fighting form. I don't understand why the Honda engine sounds so awful at low revs. I know that it's not designed to run at low revs, and under power it actually sounds pretty good, but in the pit lane it's like a bag of spanners in a tumble dryer. It would be great to see three or more teams regularly fighting over the top step on the podium, wouldn't it? Red Bull, in my armchair enthusiast's opinion, had the best chassis last season, it was only the relatively under-powered Renault engine that let the side down as it seemed obvious to me that both drivers and chassis were up to the job. I've said in the past that Verstappen is mighty fast yet hasn't (yet) got the maturity to go with it, I still stand by that now though even if he doesn't mature you wouldn't lose any money on betting that he'll add some action on a race weekend. That's not a bad thing. Re the change in tyre markings, it's actually quite simple and I for one am glad that the colour coding has been revised. Did anyone else watching the session notice the rear wing end-plate ERS lights today? I wasn't aware of this change until today, will they be lit in wet weather as per the light at the rear of the crash structure? Amazing initial reliability from most of the teams and great to see McLaren making progress. Would love to see Williams improve too but might have to wait a while longer for that! Well at least until they get a car to the track! Horner is making enhusiastic sounds about the Honda power plant. It seems the best install they have had in F1 sofar. Well, they did have > two years to make the chassis and engine designs compatible. It seems the best install they have had in F1 sofar. I would have thought that would have been when they won four world titles with Renault power. He was referring to the process of integrating the two. They (Rich Energy) are ripe to have the pee taken out of them. I just hope that Haas a) are able to get another title sponsor next season when RE bugger off and b) Haas don't suffer too much from being what could reasonably be considered to be Ferrari's 3rd team after Alfa. Haas and Ferrari share the same wind tunnel however surely Alfa is now No.2. Albon is currently running around the circuit with green, as opposed to red, flashing ERS lights due to the fact that he still doesn't have his Super Licence, this is due to be granted soon by the World Motorsport Council. He has enough points to qualify due to his '16/'17/'18 results in GP2 and GP3, it's just a matter of sorting the paperwork, in the meantime he's got the equivalent of green "P" plates on his car. I've just been comparing lap times for yesterday and (so far) today with last year's practise and quali times at Barcelona. Fastest time set in today's morning test session was 1.18.247, set by Leclerc on the same compound tyres used by his teammate yesterday. Of course there are many variables etc considering we haven't even concluded day 2 of 8 test days however these times are shaping up quite well considering they were supposed to be a net 1.5sec slower than race speeds last season. Very impressed by the number of laps each team is able to run, we don't know how hard everyone is pushing however it's encouraging to see an increase in reliability over this time last year. I'm also concerned about Williams, depending on the source they may not even make it to the circuit tomorrow. Last edited by CardShark; 19th February 2019 at 16:08. Isn't the track surface curing a big contributor to this years lap times? It's certainly one of the factors. It was a freshly laid surface this time last year IIRC and with the race being held in May (where the above times were achieved) there wouldn't have been that much track action with other race series between F1 testing and the actual race weekend. The track may have not fully matured, as it were, and it may offer more grip now, however the test times so far are quicker than I was expecting and they'll only, on average, get faster from now on. The big question is, of course, will the aero changes make a difference come race weekends allowing cars to run closer together? That won't be answered until the season is underway. With thís sort of reliability Ferrari could do a 24h at Le Mans!! It'll be [Rob Smedley's] role to give greater insight as to how the teams and cars function on a technical basis, as long as the correct balance is achieved between getting newbies hooked and more experienced fans informed then this can only be good news.